You probably all know how much of a beauty junkie I am and how I've been overspending on beauty products. Geesh, I need to rethink my budgeting techniques (hell, I don't even have one. LOL). But I actually have no regrets and it's just awesome that the local beauty industry has been evolving step by step so I'm pretty proud to say that Filipino beauty products will make it big out of the country soon. I'm pretty sure of that! Look at all the supports they've been getting from the beauty bloggers online? We sure do know how to support and encourage the local beauty industry to do better always, eh? And because we, Filipino women, have been constantly looking for ways on how we can make the most out of our beauty shopping, HBC brings us another awesome gift, which I'm sure some of you won't be able to resist. 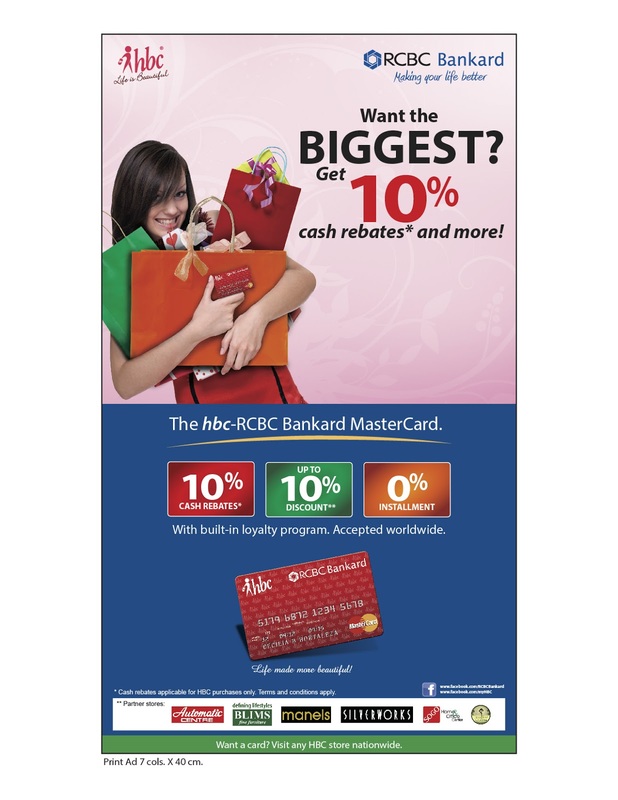 HBC now partners with RCBC for the HBC-RCBC Bankard Master Card (oooh, they all rhyme!). Credit card, you say? Wait, hold your horses. There's definitely more than that shining logo of HBC on your credit card. It promises to deliver 10% cash rebate for purchases at HBC and HBC ShopMore upon a corresponding outstore spend of P10,000 and up and is considered as the BIGGEST rebate in the industry, people! Cash rebates of 0.25% are also available for retail transactions outside HBC. Yun lang? Wait, akala mo lang! There's more! Cardholders who use the credit card at HBC's exclusive merchant partners such as Automatic Center, BLIMS Furniture, Manels, Silverworks, SOGO Home and Office Center and Treetop Adventure in Subic will also get awesome discounts of as much as 10%. Pluuuus, they are entitled to pay their HBC transactions in installment of 3, 6, 9 and 12 months ar 0% interest! At hindi pa diyan nagtatapos 'yan! There would be quarterly members-only sale, free facial on your birthday, special buys and discounts on new products, and access to special events like hairstyling and makeup seminars are also part of the EXCLUSIVE benefits you'd get from having an HBC-RCBC Bankard Mastercard. And just like other RCBC Bankard Credit Cards, there are also value added services like the SMS-based Spend Monitor, Spend Analyzer, RCBC Bankard Rewards, Dining-on-Demand and so much more! For more details, you may opt to visit: http://www.rcbcbankard.com/rcbc-bankard-credit-card/hbc-rcbc-bankard-mastercard/ or visit your nearest HBC or HBC ShopMore Store. no longer function and also not to forget the rate kids tend to lose things.